Fewer women in Wakefield are smoking in pregnancy; however Wakefield remains an outlier when compared to our neighbours and the national average. Smoking in pregnancy rates are highest in the most deprived areas in Wakefield. 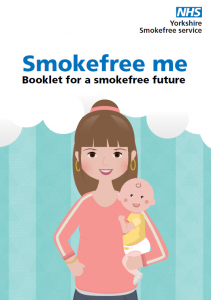 Young mums, under the age of 20 have the highest smoking in pregnancy rates. South Elmsall and South Kirkby is the electoral ward with the highest smoking at time of delivery rate, Wrenthorpe and Outwood West has the lowest rate. On average there are around 4,000 births each year in Wakefield; most women are aged between 20 to 30 years when they give birth, birth rates are higher in the more deprived areas in Wakefield. More information about births can be found on the following here. Smoking in pregnancy is the single biggest change that can improve the health of mum and baby. It is the single biggest risk factor for still birth, it increases the risk of serious pregnancy related complications and complications during labour; it also increases the risk of miscarriage, premature birth, low birth weight, sudden unexpected death in infancy, and is associated with respiratory problems such as pneumonia and asthma which may lead to death in babies or infants. Higher rates of miscarriage in women from more deprived areas, found nationally, can be partly explained by the higher rates of smoking in pregnancy, making stopping smoking the single most effective thing we can do to reduce these risks. Smoking in pregnancy rates are much higher in Wakefield District than elsewhere. Although fewer women are smoking in pregnancy, Wakefield District has one of the highest smoking in pregnancy rates in the country. The following interactive dashboards look at smoking in pregnancy in Wakefield. This dashboard shows smoking prevalence at time of booking and smoking prevalence at time of delivery over time. You can use the interactive dashboard to select the indicator you are interested in and also select specific areas, to see how things have changed over time. 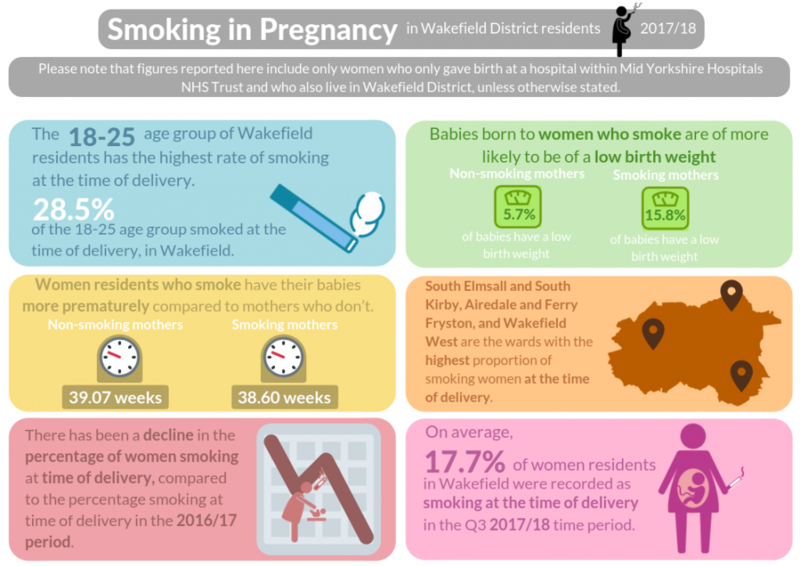 This dashboard shows smoking in pregnancy by areas in Wakefield District. You can select which smoking indicator you want to look at from the menu on the right side; choose either smoking at time of booking or smoking at time of delivery. This will then show the smoking rates for that indicator by area. You can also change the area type (e.g. electoral ward or deprivation) and year. Smoking in pregnancy is higher in more deprived areas. This dashboard shows smoking prevalence at time of booking and smoking prevalence at time of delivery by age of mother. You can use the interactive dashboard to select the indicator you are interested in and the year, to see how things smoking prevalence varies by age. Younger mums have higher smoking rates. This dashboard shows smoking prevalence at time of booking and smoking prevalence at time of delivery by electoral ward on a map. You can use the interactive dashboard to select the indicator you are interested in and the year, to see visually how wards compare to each other. Appointments available at many central locations including Pontefract, Castleford, Normanton, Knottingley and Wakefield. Home visits are also available, if required. The role has been very successful in working across Mid Yorkshire, with other services including the stop smoking service and communities. As a result of this success the role has been extended until 2020 with plans to further evaluate and hopefully continue as part of mainstream services.